To buy the DesBarres Revolutionary War map, or to auction, consign or sell your DesBarres Revolutionary War map of Boston Harbor that is for sale, please email Nate@NateDSanders.com or phone Nate D. Sanders Auctions (http://www.NateDSanders.com) office for a FREE APPRAISAL at (310) 440-2982. DesBarres Revolutionary War map entitled ”Chart of the Harbour of Boston”, published in London circa 5 August 1775, at the very beginning of the War. Large map measuring 42” x 29.5” shows Boston as it was before defenses were constructed by the Americans during the Siege that begin in April 1775. Created by master cartographer Joseph F.W. 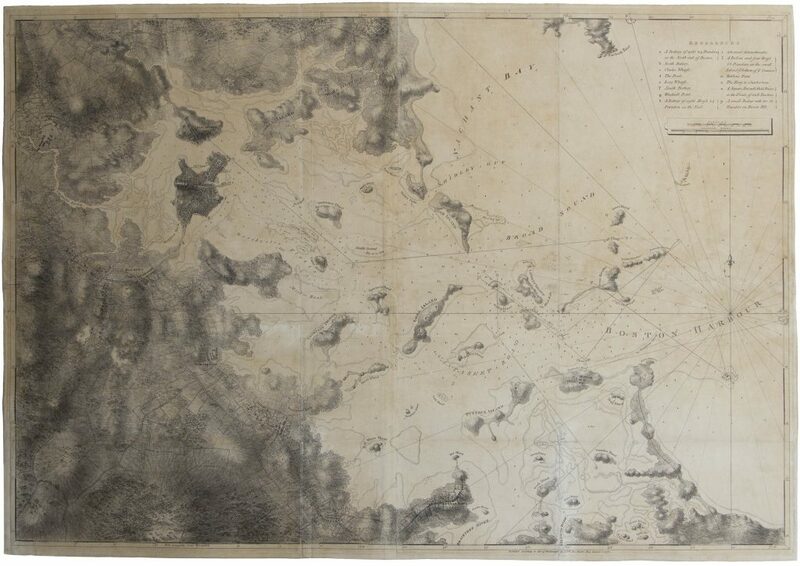 DesBarrres, map was based on a survey done in 1769 by ship’s captain George Callendar, and is considered one of the most important Revolutionary War era maps of Boston Harbor, showing the small islands within, the Charles and Braintree Rivers, and the inland areas of Roxbury, Dorchester and Charlestown. Copper-plate engraving measures 42” x 29.5”, printed on two sheets joined vertically at center. Professional restoration includes small portions of infill and later backing removed. Overall in very good condition. Minimum bid $10,000. Meriwether Lewis 1807 Document Signed Related to the Famed Lewis & Clark Expedition — Lewis Receives 5 Months Pay From the Expedition Upon Returning to D.C.
”Of courage undaunted; possessing a firmness and perseverance of purpose which nothing but impossibilities could divert from its direction; careful as a father of those committed to his charge, yet steady in the maintenance of order and discipline; intimate with the Indian characters, customs, and principles; habituated to the hunting life; guarded by exact observations of the vegetables and animals of his own country against losing time in the description of objects already possessed; honest, disinterested, liberal, of sound understanding, and a fidelity to truth so scrupulous that whatever he should report would be as certain as seen by ourselves…” (”History of the Expedition,” 1814). In the months immediately preceding the expedition, Lewis sought training in the use of astronomical instruments and in the art of map-making. He also chose a companion officer, William Clark of Louisville. While the expedition did not achieve the primary objective of finding the elusive Northwest Passage, it contributed significantly to the understanding of the geography of the Northwest and produced approximately 140 maps, the first accurate maps of the area. In addition, it documented 100 newly discovered species of animals, approximately 170 plants, and it also established friendly relations with three dozen Indian tribes. The knowledge they obtained sparked American interest in the west, and strengthened the nation’s claim to the area. Meriwether Lewis returned to Washington, D.C. from his three year journey in late December of 1806. 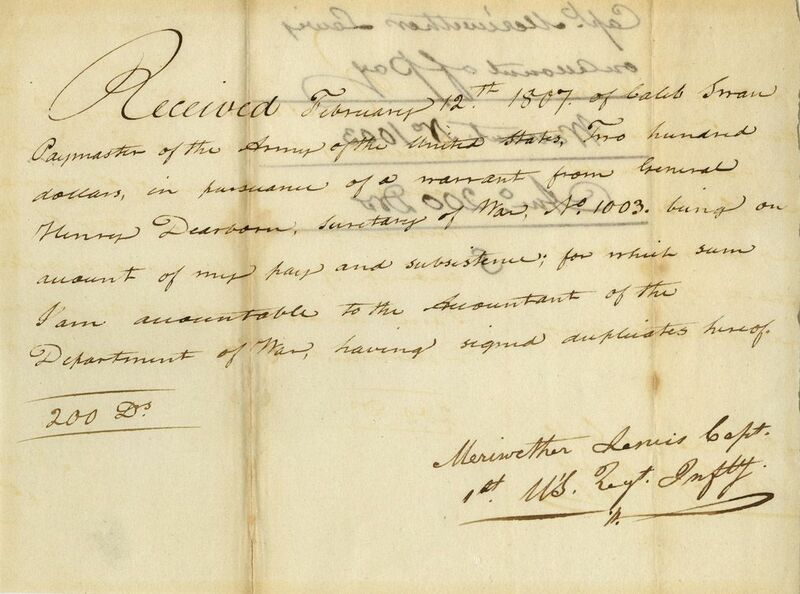 After returning from the expedition, Lewis received a reward of 1,600 acres of land. In addition, Thomas Jefferson appointed him Governor of the Louisiana Territory. However, Lewis was not confirmed by the Senate until March 1807 and he remained a Captain in the interim. Base pay for Captains at this period was $40 per month so the present receipt would represent five months’ salary. 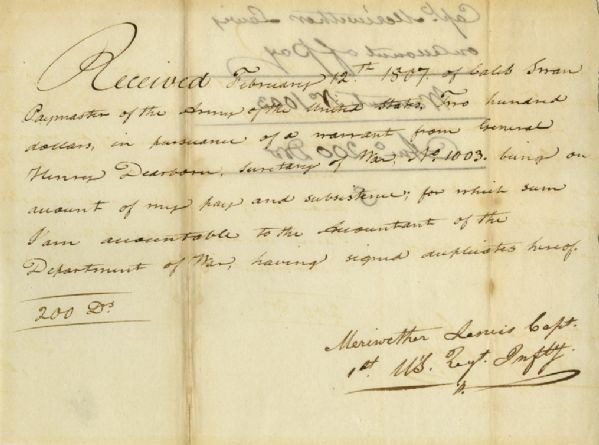 A supremely rare document directly linking Meriwether Lewis to the Lewis & Clark Expedition. Items of Lewis & Clark related to the famed expedition are of the utmost rarity. Docketed on verso. Toning to folds and showthrough, otherwise near fine condition. Sold for $30,768. To buy the DesBarres Revolutionary War map, or to auction, consign or sell your DesBarres Revolutionary War map that is for sale, please email Nate@NateDSanders.com or phone the Nate D. Sanders Auctions (http://www.NateDSanders.com) office for a FREE VALUATION at (310) 440-2982.